Blakey Topping seen from the west. The hill of Blakey Topping is another proposed 'sacred hill' like the nearby Howden. They are believed by some authors to have been of ritual significance to the early inhabitants of the area and possibly the inspiration for some of the larger burial mounds and also the manmade Silbury Hill in Wiltshire. Blakey Topping has two quite different aspects depending on which direction it is viewed from. 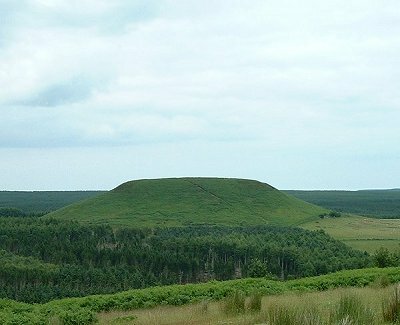 When approached from the west from the Hole of Horcum along the track known as the Old Wife's Way the hill appears steep sided with a distinctive flat top - very reminiscent of the hill in the film 'Close encounters of the 3rd kind'. 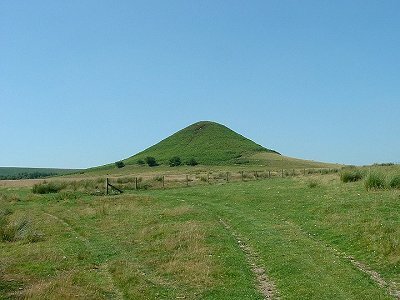 From the southeast, traveling across Thompson's Rigg, the view is totally different and it is hard to believe it is the same hill, as its form is now conical and it looks strikingly similar to Howden Hill when viewed from the same angle. It is probable that some stones have been lost from the site and what remains is as follows. 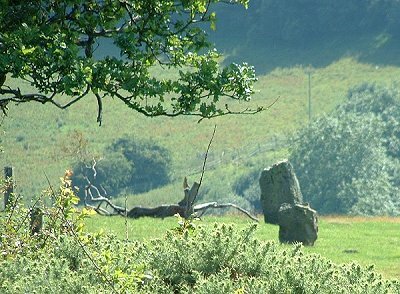 There are 2 stones on the west side in a SSW to NNE alignment, with the stone to the north being 80cm high, the top having been broken off. The southern stone stands 15 metres to the SSW and is 1.7 metres tall. On the eastern side of the alignment the southernmost stone is now part of the field boundary and is 20 metres to the southeast of the southern stone on the west side. It stands 1.3 metres above the modern ground level with a slight lean to the south. The north stone of this pair has been moved at some point in time and is now 85 metres north of its partner and is 1.1 metres high. If the site was an alignment and not a circle then the line of these stones would have continued the curve formed by the 3 stones still in their original positions or formed 2 parallel rows, part of which survives as the 2 western stones - without knowing the original number and location of the stones it is impossible to tell. The view from the southeast along Thompson's Rigg. The two western stones from the alignment.